The process of cell culture involves the growth or proliferation of cells extracted from plant or animal sources under controlled conditions in an artificial media. Cell culture is an integral part of biotechnology and finds usage in various applications both commercial and research. Cell culture studies are now employed in the field of genetics, cell therapy, and regenerative medicine, among others. Culturing of cells under laboratory condition allows to study both physiology and biochemistry of cells, which further offers research scopes that are difficult to conduct in-vivo. The effects of drugs or other compounds can easily be tested on cultured cells by controlling parameters such as culture medium, culture conditions, population density, and growth rate. Furthermore, it offers huge prospects in the field of genetics and allows investigating the role of different genes. Defined supplements in the cell culture media has shown promising impact since decades, aiding in the growth and productivity and maintaining the consistency of cultured cells. With the rise in the demand for cell culture optimization projects, there is a paradigm shift toward the increased application of defined, animal-free supplements for biopharmaceutical, vaccine, and stem cell manufacturing. Recombinant proteins serve as defined supplements in the cell culture media that boost the growth, productivity, and consistency of cultured cells. The use of these supplements acted as a major driving factor toward the adoption of serum-free media for culturing cells and development of cell-lines. The market is expected to grow due to the benefits of recombinant supplements over normal animal-derived supplements. Recombinant cell culture supplements are purer than animal-derived supplements in terms of consistency and safety profile. They are also cheaper and require less raw materials to form a complete cell culture media as compared to their animal counterparts. Other factors include rising investment in the R&D of life sciences and increasing demand for cell culture supplements. 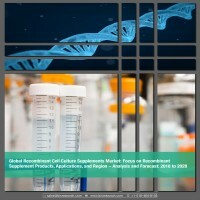 The global recombinant cell culture supplements market is segmented based on products into various recombinant products, such as recombinant insulin, recombinant transferrin, recombinant trypsin, recombinant albumin, recombinant aprotinin, and recombinant epidermal growth factor, among others. On the basis of the application of these recombinant supplement products, the market can be segmented into stem cells and regenerative medicine, bioproduction, and academics and research. The market analysis includes an in-depth examination of the key ecosystem players, key strategies, and developments taking place in this market. Additionally, it includes market dynamics (market drivers, opportunities, and challenges) and industry analysis. Geographically, the market can be segmented into five distinct regions including, North America, Europe, Asia-Pacific, Latin America, and Rest-of-the-World. The purpose of the study is to gain a holistic view of the global recombinant cell culture supplements market in terms of various factors influencing it such as key market trends, competitive and regulatory aspects of the market and scientific innovations with respect to product evolution. The scope of the report is centred upon conducting a detailed study of the solutions allied with recombinant cell culture supplements market, which involves wide range of products used in biotechnological applications. The recombinant cell culture supplements market is segmented into three different parts: ‘by products’, ‘by application, and ‘by region’. The report offers the reader with an opportunity to unlock comprehensive insights with respect to the market and helps in forming well informed strategic decisions. The research uncovers some of the substantial parameters that must be taken into consideration before entering the market. This research report aims at answering questions related to various aspects of the global market with the help of the key factors driving the market, threats that can possibly inhibit the overall market growth, and the current growth opportunities that are going to shape the future trajectory of the market expansion. The study considers the growth-share matrix model for a comprehensive study of the global recombinant cell culture supplements market and assesses the factors governing the same. Detailed product mapping have been included in the report. The market (by region) has been further sub-segmented in various countries, and in each sub-segment the key market trends, list of the key players, and recent developments have been discussed. • What are the major market drivers, restraints, and opportunities in the global recombinant cell culture supplements market? • How will each segment of the global recombinant cell culture supplements market grow during the forecast period, and what will be the revenue generated by each of the segments by the end of 2028? • What are the major regulatory authorities/associations/consortiums affecting the global recombinant cell culture supplements market? • What are the types of recombinant cell culture supplement products in market and what are their market shares? • In 2017, which recombinant supplement type was the dominant type in the market in terms of revenue? • Which recombinant supplement type is expected to have the highest CAGR during the forecast period? • How has the market been segmented based on application? In 2017, which application area had the largest share and the fastest growth rate in the global recombinant cell culture supplements market? • Which geographical region will contribute to the highest sales of the recombinant cell culture supplements during the forecast period, and which will have the highest CAGR? The report also profiles 17 companies including several key players, such as Thermo Fisher Scientific, Hi-Media Laboratories, BBI Solutions, PeproTech, Inc., InVitria, Sino Biologicals, STEMCELL Technologies, Irvine Scientific, Merck KGaA, Corning Incorporated, Gemini Bio-Products, Novozyme A/S, and Repligen Corporation, among others. With advancement in technology, techniques, and methodology, several innovative products are developed and commercialized by various industries into the market. Development in biotech and healthcare industries has led to the emergence of modern day cell culture process and techniques. Cell cultures are currently used for various applications such as bioproduction of vaccines, monoclonal antibodies, and proteins, among others. Also, research and developmental activities have increased the usage of cell culture techniques for the genetic engineering, genomics, and therapeutic research. Cell culture involves different types of products for the growth of cells such as media, sera, reagents, and supplements. Supplements help in the growth of the cell lines and culture. The global recombinant cell culture supplements market was valued $230.5 million in 2017 and is anticipated to reach $788.6 million by 2028. The market is expected to grow due to the benefits of recombinant supplements over normal animal-derived supplements. Recombinant cell culture supplements are purer than animal-derived supplements in terms of consistency and safety profile. They are also cheaper and require less raw materials to form a complete cell culture media as compared to their animal counterparts. Other factors supporting the growth of the market include increasing investment in the R&D of life sciences and biotechnology industries. The purpose of the study is to gain a holistic view of the global recombinant cell culture supplements market in terms of various factors influencing it such as key market trends, competitive and regulatory aspects of the market, and scientific innovations into biotechnology and cell culture fields. The scope of the report is centered upon conducting a detailed study of the solutions allied with the recombinant cell culture supplements market, involving products used for different applications such as bioproduction, research and academics, and stem cell and regenerative medicine. The global recombinant cell culture supplements market is segmented into three different parts: by products, by application, and by region. Based on applications, the market can be sub-segmented into stem cell and regenerative medicine, bioproduction, and academic and research. In 2017, stem cell and regenerative medicine was estimated to be the dominant application segment due to the increased demand for investment in the stem cell and regenerative medicine industry in developed as well as developing nations. However, the academic and research industry is expected to register the highest CAGR due to the rising investments and increased regulatory support for this industry. As recombinant supplements ensure enhanced cell viability and improved batch-to-batch consistency, they are increasingly used for research. The recombinant cell culture supplements market can be further segmented based on the type of recombinant products into transferrin, insulin, albumin, trypsin, aprotinin, lysozyme, Insulin-like growth factor, stem cell factor, epidermal growth factor, and others. Recombinant albumin was the dominant segment in terms of revenue in 2017 while recombinant epidermal growth factor (rEGF) segment is expected to be the fastest growing segment during the forecast period from 2018 to 2028. Geographically, the market is segmented into five distinct regions including, North America, Europe, Asia-Pacific, Latin America, and Rest-of-the-World. North America, followed by Europe, is the leading contributor of the market. Within North America, the U.S. contributed to almost 93% of the total share, and the rest of the share was occupied by Canada in 2017. Within Europe, Germany dominated the market in 2017. However, the market for the Asia-Pacific region is expected to witness the high growth rate, during the forecast period from 2018 to 2028, as compared to other regions. The recombinant cell culture supplements market has a promising potential for the growth in the coming years with the increased usage of cell cultures and biotechnology in the modern day science. The report provides an in-depth SWOT analysis of different key players of the market, supported by extensive financial summary of each company. The key players of the market are Thermo Fisher Scientific, Hi-Media Laboratories, BBI Solutions, PeproTech, Inc., InVitria, Sino Biologicals, STEMCELL Technologies, Irvine Scientific, Merck KGaA, Corning Incoporated, Gemini Bio-Products, Novozyme A/S, and Repligen Corporation, among others.